Oyster Mushroom (Pleurotus ostreatus) is a large, common, widespread, and widely known bracket (shelf-like) fungus. 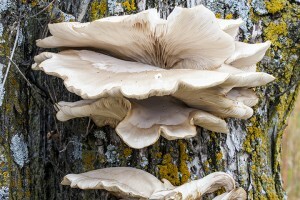 This mushroom is found usually on hardwoods, especially elm, cottonwood, alder, and oak. It is rarely found on conifers. It usually appears as overlapping shelves on a log or stump, sometimes on a live tree. It enters the tree through a wound and infects the wood causing white rot. It first appears in the fall after a heavy rain. There are many mushrooms with a similar growth habit and appearance. 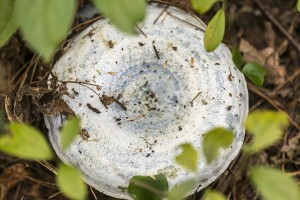 This species is identified by growing on wood in shelf-like clusters; large size; absent or rudimentary stem; whitish or pale lilac spore print; host species; and late (fall) appearance. This entry was posted in Fungi and tagged Oyster Mushroom, Pleurotus ostreatus on September 21, 2015 by John Valo. Common Greenshield Lichen (Flavoparmelia caperata) is a widespread and extremely common lichen. It is found firmly attached to the bark of broadleaved trees, fenceposts, and occasionally to rocks. It appears as a yellowish-green disk, 2″ to 8″ in diameter, divided into numerous irregular lobes. Unlike most lichens, Greenshield lichens (Flavoparmelia spp.) are relatively tolerant of air pollution. They are among the first noticeable lichens to return to areas that have been rid of lichens due to pollution. 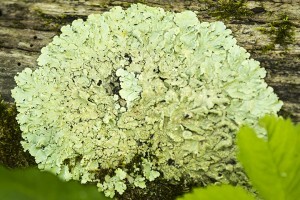 The Greenshield lichens are similar in appearance. 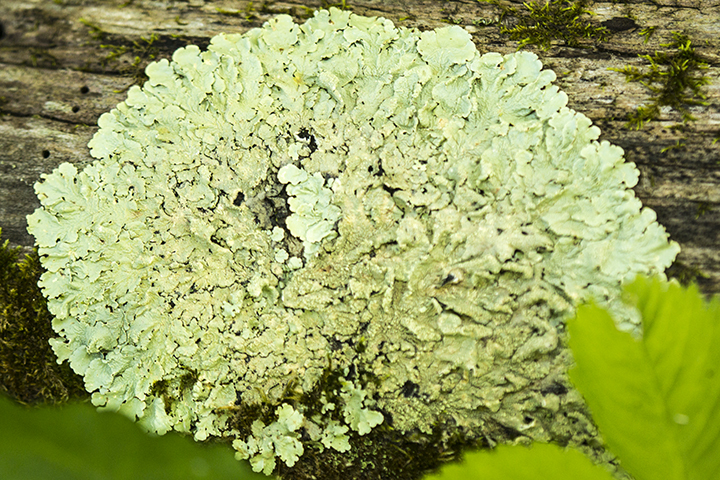 Common Greenshield Lichen is identified by its substrate, which is usually tree bark or a fence post; and by the upper surface, which does not have white pores or pustule-like growths. This entry was posted in Fungi and tagged Common Greenshield Lichen, Flavoparmelia caperata on September 19, 2015 by John Valo. Indigo Milk Cap (Lactarius indigo) is a widespread but uncommon, distinctively colored mushroom. In the summer and fall it can be found on the ground alone, scattered, or in groups, in oak and pine woodlands. It grows on the roots of hardwoods, including oak, ironwood, and blue beech; and pines. The cap is blue when young, often with concentric rings of darker blue. As it ages the color fades to silvery-blue and it may develop greenish stains. The flesh instantly turns blue when cut and it slowly bleeds blue latex. The flesh and latex eventually turn green with exposure to air. No other milk cap mushroom “bleeds blue”. This species is further identified by the blue gills. This entry was posted in Fungi and tagged Indigo Milk Cap, Lactarius indigo on September 14, 2015 by John Valo. Silvery checkerspot (Chlosyne nycteis) is a common, sometimes locally abundant, medium-sized, brushfoot butterfly. It is found from early June to late July in moist woodland openings and edges, meadows, and marshes. It flies slowly and usually no more than one foot off the ground. The caterpillar is all black with black, branched spines and a dusting of white specks. When it is disturbed it will often curl up and fall to the ground. 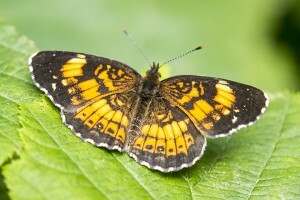 Adults are similar in appearance to Harris’ checkerspot, Gorgone checkerspot, and pearl crescent. Silvery checkerspot is distinguished by forewing upperside black apical area with fewer and smaller pale orange and white spots; hindwing upperside black border with no or only faint chevrons, submarginal spots completely surrounded by orange, and at least one submarginal spot on each hindwing with a white center; and hindwing underside pale, with no reddish-orange, and with the submarginal band of white spots interrupted with a dark patch and large silvery crescent. This entry was posted in Insects and tagged Chlosyne nycteis, silvery checkerspot on September 11, 2015 by John Valo. 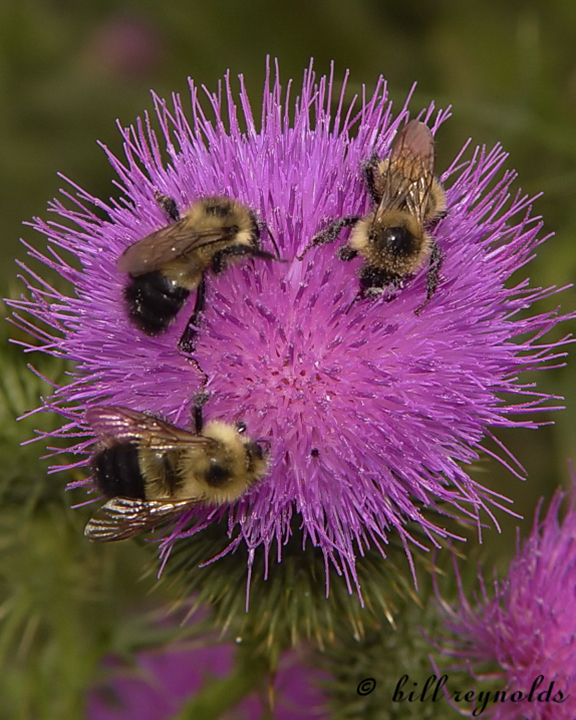 Northern amber bumble bee (Bombus borealis) is a large, frequently found, colonial, ground-nesting bumble bee. It is found in woodlands from May to September. The abundance of this species has decreased 7.11% across North America when comparing historical records (1802 to 2001) to current records (2002 to 2012). This is not considered a serious decline and supports the International Union for Conservation of Nature and Natural Resources (IUCN) ranking of Least Concern. In Minnesota, the story is a little different. The extent of occurrence (EOO) of this species in Minnesota has contracted significantly. The historical EOO shows the range to include all but the far southwestern corner of the state. The current EOO shows no occurrences south of a line from the North Metro area in the east to Breckenridge on the western border. This species is identified by conspicuous yellow hairs on the top of the head and on the face; a black stripe on the thorax between the bases of the wings; brownish-gray hairs on the sides of the thorax; four yellow and two black abdominal segments on the female; and the top of the lateral simple eyes in line with the top of the compound eyes. 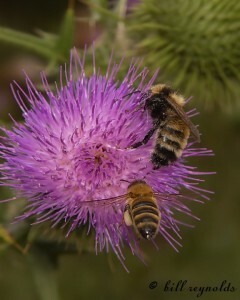 This entry was posted in Insects and tagged Bombus borealis, northern amber bumble bee on September 9, 2015 by John Valo. 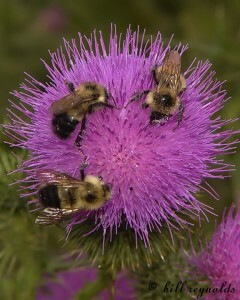 Half-black bumble bee (Bombus vagans) is a common, small, colonial, ground-nesting bumble bee. It is found in shady forests wooded areas, urban parks, wetlands, and gardens from June to August and possibly later. The nests are annual—only mated queens overwinter, emerging from hibernation in May. They build nests mostly underground but sometimes on the surface of the ground or in hollow trees. As the common name suggests, this bumble bee is half black. The head, thorax, and first two abdominal segments are yellow. The rest of the abdomen is black. Other identifying features of this species are a small, round, black spot on the thorax; the top of the lateral simple eyes in line with the top of the compound eyes; and the area on the face corresponding to the cheek longer than wide. 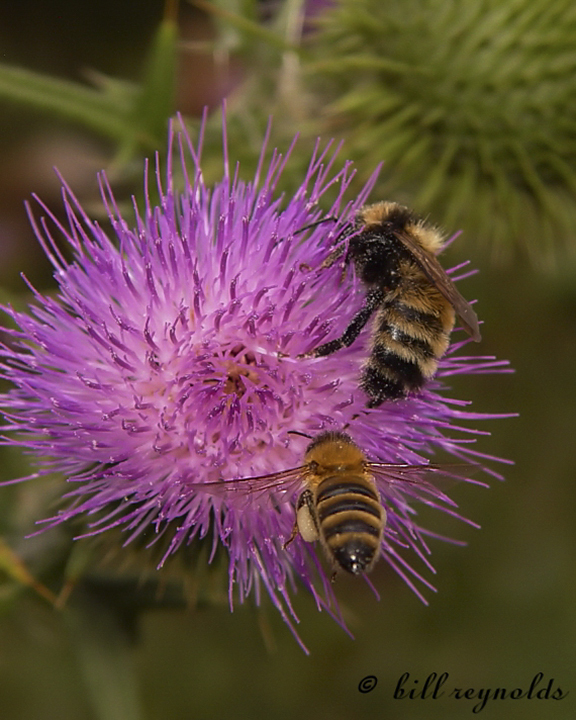 This entry was posted in Insects and tagged Bombus vagans, half-black bumble bee on September 9, 2015 by John Valo. 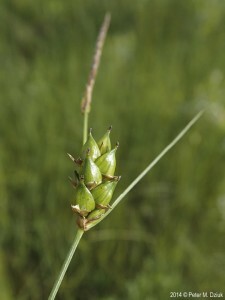 Few-seeded sedge (Carex oligosperma) is found in bogs, sedge meadows, and peaty wetlands. It grows only in acidic soils. It is common in bogs along with woolly-fruit sedge, where the long rhizomes of the two sedges weave together and help create floating vegetative mats. The leaves are wiry, stiff, and no more than ⅛″ wide, giving this plant one of its other common names, wiregrass. This species is identified by narrow leaves with margins rolled inward; reddish-purple sheaths of basal leaves; lack of cross lines between the veins of the leaf sheath; unisexual flower spikes; and short, plump pistillate spikes with just 3 to 15 spikelets. This entry was posted in Plants and tagged Carex oligosperma, few-seeded sedge on September 7, 2015 by John Valo. Migratory grasshopper (Melanoplus sanguinipes) is a common, medium-sized, spur-throated, short-horned grasshopper. 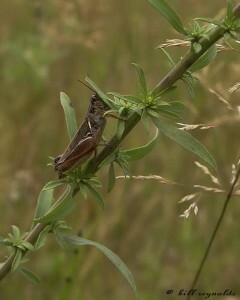 It may be the most common species of grasshopper in North American grasslands. 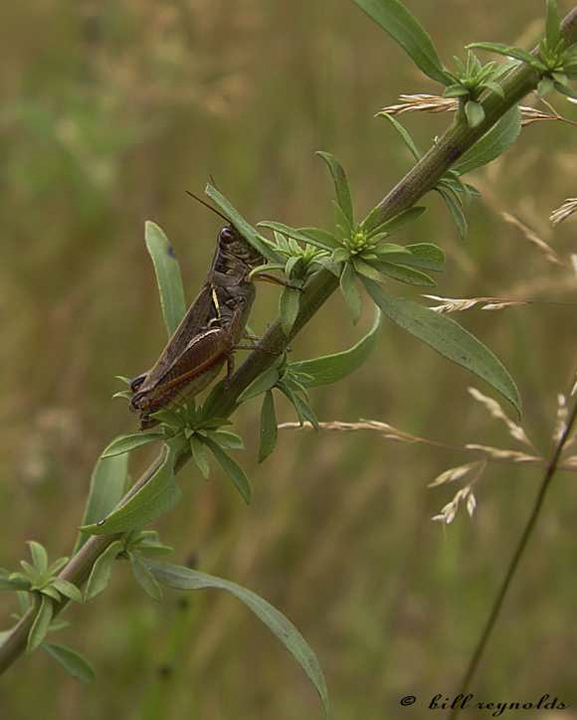 It is a serious agricultural pest, causing more crop damage than any other species of grasshopper in North America. As its common name implies, the migratory grasshopper congregates into swarms and migrates in search of food. When they do they may devastate all leafy vegetation wherever they land. Swarms have been detected at all elevations up to 13,000 feet and have been recorded traveling as much as 575 miles. The family short-horned grasshoppers have antennae no more than half the length of the body, upper thoracic plate (pronotum) not extending over the abdomen, well developed wings, and a three segmented foot. The subfamily spur-throated grasshoppers have a tiny bump on their “throat”; a flat, rounded pronotum; a vertical face; a clear hindwings. This species is identified by hind wings that are longer than the body; front wings that are about as long as the body and are mostly transparent but have dark spots; a pale yellow stripe behind the eye; a banded hind femur; and features at the tip of the abdomen visible only in an extreme close-up photo. This entry was posted in Insects and tagged Melanoplus sanguinipes, migratory grasshopper on September 5, 2015 by John Valo. 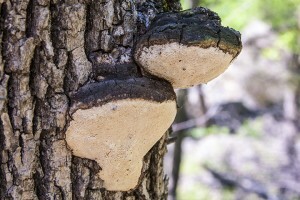 False Tinder Fungus (Phellinus igniarius) is the most common cause of White Trunk Rot in North America. It infects 21 genera of hardwood trees but is found most often on birch. It turns the wood of infected trees into a soft, white, spongy mass. The fruiting body is a woody, bracket-shaped conk with pores on the underside. It is usually found on the trunk of a living tree. This species is identified by the host (hardwoods); the black, often cracked upper surface of older specimens; the dark brown or rusty brown flesh; the brown underside; the layered pores; and the white lines running through the flesh, visible in cross section. This entry was posted in Fungi and tagged False Tinder Fungus, Phellinus igniarius on September 3, 2015 by John Valo. 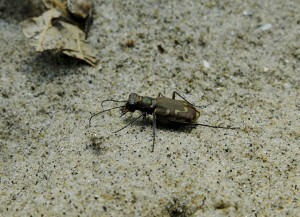 Bronzed tiger beetle (Cicindela repanda) is one of the most common species of tiger beetle in North America. It is found in open, sunny areas with little vegetation next to a stream or river. It is active during the day but is a fast runner, difficult to catch or photograph. The larva can be seen on the ground, anchored to the mouth of its tunnel, waiting for any insect unlucky enough to pass by. This species is identified most easily by the pale markings on its wing coverings (elytra). The crescent-shaped mark in the forward area (closest to the head) on one elytra points to the one opposite, and is connected to, or only narrowly separated from, the mark on the margin of the middle area. Also, the vaguely S-shaped mark in the middle area is complete, not broken. This entry was posted in Insects and tagged bronzed tiger beetle, Cicindela repanda on September 1, 2015 by John Valo.